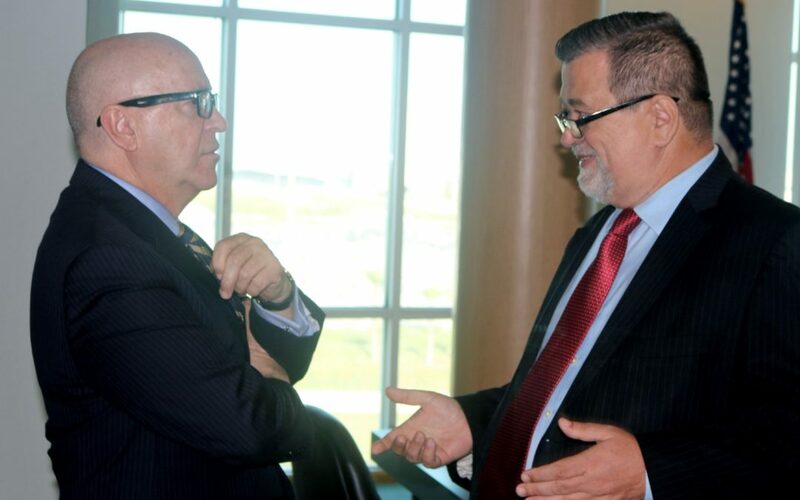 Leszek Ladowski, president of the Polish-American Chamber of Commerce of Florida and the Americas, right, discusses trade opportunities with Port Manatee Executive Director Carlos Buqueras. PALMETTO, Florida – Port Manatee is being looked at as a gateway linking Poland and all of Central and Eastern Europe with the entire Western Hemisphere following a visit Thursday [April 19] to the Florida Gulf Coast port by the president of the Polish-American Chamber of Commerce of Florida and the Americas. “We can establish a bridge,” said Leszek Ladowski, president of the Miami-based Polish trade organization. “It’s not just about the 21 million people who live in Florida. It’s about all the connections in Latin America and throughout the Americas. Ladowski, who lived in Latin America for 14 years, said Poland, as the leading free-market economy of the 12-country Central and Eastern Europe region, has been increasing its trade with the United States at an annual pace of more than 20 percent and is eager to pursue solid commercial links throughout the Americas. In the past several months, Port Manatee and its trade hub have also hosted high-level officials representing such nations as Canada, Chile, Colombia, Costa Rica, Dominican Republic, Ecuador, El Salvador, Germany, Guatemala, Honduras, Japan, Mexico, Peru and Spain.